It was May 3, 1878, and Daniel Aldrich was tending to his farm on Log Road when he heard the rumble of thunder in the distance, but thought nothing of it. It was after all, mid-spring, generally not the time to worry about severe electrical storms. The next time he heard it the sound was closer, and he noticed the sky was now visibly darker. 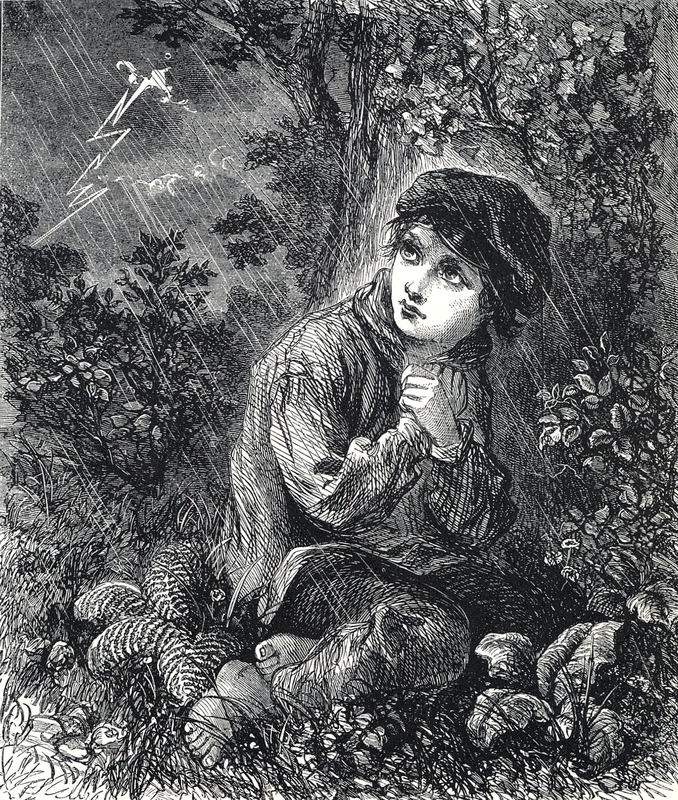 The storm was getting closer, and even before the first drops began to fall, Daniel noted that the air now “smelled” like rain. Just to be on the safe side, he went into the barn to feed the livestock until the storm passed. He was hardly inside when the skies opened up and the rain began pelting the roof, but what came next was an experience he would always remember. There was a blinding flash of light followed by a tremendous clap of thunder that seemed to erupt almost directly overhead, the sound of which seemed to shake the solid oak timbers of the barn. That was startling enough, but what happened next was even more remarkable. Almost immediately, several orbs of glowing light came bounding through the door and began dancing about the barn! Before Daniel could even comprehend and react to what was happening, the orbs abruptly vanished leaving behind the distinctive smell of sulfur, often referred to in the 19th Century as “brimstone”, a sure omen of evil. The whole ordeal was over in a few seconds, but Daniel and his livestock were left understandably shaken. Emerging from the barn he could see that the only real casualty of the incident was an ancient Ash tree fifty feet away that had been split into three parts, its bark completely blown away by the bolt of lightning. Even more intriguing were the three darkened pathways leading away from the tree; one directly to the door of the barn, where the lightning had evidently traveled underground. The incident was so unusual that it was reported in the Woonsocket Patriot where the event was described as one of “considerable excitement”. What Daniel had apparently witnessed was an extremely rare phenomenon known today as “ball lightning”. It’s so unusual that some scientists dispute its existence, but it’s likely that if Daniel were around today he would argue the point. A lightning storm can be fascinating to watch. We see a flash of light, followed by a tremendous boom, and count off the seconds between the two to roughly determine how far off the storm is. The spectacular light shows provided courtesy of Mother Nature can be beautiful, yet destructive and deadly, so we observe with reverent care. Few spectators ever consider how lighting has played a role in the course of history. It is believed that early man got his first fire from lightning strikes. Ancient civilizations thought of thunder and lightning as a sign that the gods were angry, and planned their politics and wars accordingly. Benjamin Franklin attempted to scientifically understand the properties of lightning, and the image of him flying a kite in the middle of an electrical storm comes to mind, although experts and historians are divided as to whether that actually happened. What Franklin did invent was the lightning rod, no doubt responsible for saving many buildings (Some even in Smithfield.) that might otherwise have been destroyed. Lightning has even played a role in shaping local history, for it could be said that lightning was responsible for Smithfield obtaining its first fire engine which ultimately led to the formation of the Greenville Fire Company. On the night of June 20, 1870, as a thunderstorm passed over Greenville, lightning struck Whipple & Co. Wheelwright Shop located in the heart of the village on Putnam Pike where a florist shop stands today. As shouts of “fire” sounded, a bucket brigade was hastily formed, but the flames had gotten a good start and before long a neighboring building was also in flames. By morning, all that was left were piles of smoldering ruins. The incident proved the need for better fire protection so a horse drawn hand-pumper, dubbed “The Water Witch”, was purchased shortly afterwards. The apparatus arrived in Greenville in time for the July 4th celebration that year, and saw continuous service into the early 20th Century no doubt saving lives, livelihoods, and property that otherwise would have been lost. It could be argued that Smithfield’s landscape in the 1800s made for a greater potential for lighting strikes to buildings and people. By the second half of the 19th Century, the land had been cleared of many trees, leaving large tracts of open vistas as wood was harvested for everything from lumber, to heating and cooking. Although there are instances where buildings were set afire by lightning strikes, a search of town death records reveals that lightning strikes on people were just as rare then as they are today. Unfortunately, when they did occur, it was with tragic results. On May 27, 1878, just four weeks after Mr. Aldrich’s hair raising affair, four men arrived at Waterman’s Lake for a day of canoeing and fishing. It was a beautiful day and the fishing was good. After awhile, the men rowed ashore to an island in the middle of the lake where they cleaned their catch and built a small fire. As they were preparing their meal a fast moving storm came over and rain started to fall. The men weren’t overly concerned, and stayed relatively dry under the pines while waiting for the return of the sun. Suddenly a bolt of lightning hit the very tree they were sitting under, blasting it apart and tossing the men several feet. A newspaper account described the men as “mangled” by the strike. Killed instantly were Daniel Norton, of Smithfield, and William Colvin, of Scituate. The other two men, Jeremiah Angel, and Daniel’s brother Eugene, were severely injured. Even large and sturdy buildings such as textile mills were not immune from the destructive forces of lightning. On March 21, 1940, Smithfield’s fire and police departments were summoned to the Lister Mill in Stillwater after a bolt of lightning had struck the 180 foot tall smoke stack and completely blasted away the upper two-thirds of the solid brick structure. Tons of debris came crashing down through the roof smashing equipment, damaging machinery, and injuring three workers. To make matters worse, the bolt had also set fire to the roof, and the whole structure could have been destroyed had it not been for the quick actions of both workers and firemen in dousing the flames. Damage was estimated at fifty-thousand dollars, a substantial sum even today, and a remarkable sum for 1940. It has been said that lightning never strikes twice in the same place, yet the very same chimney had also been hit by lightning two years earlier causing eight-thousand dollars in damage. Smithfield has seen its share of lightning strikes, and will no doubt see more in the future. In recent times lightning has been responsible for the disruption of power and phone service. A small inconvenience when one considers what else can happen.